LEXINGTON â€” William J. 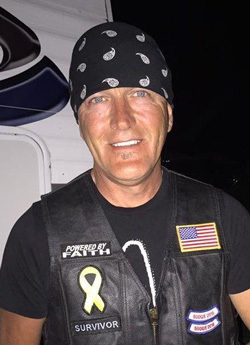 "Bill" Volk, 53, of Lexington, passed away at 8:21 p.m. Thursday (April 4, 2019) at OSF HealthCare St. Joseph Medical Center, Bloomington. His funeral will be 11 a.m. Wednesday at Carmody-Flynn Funeral Home, Bloomington, with the Rev. James Haffener officiating. Visitation will be 4 to 8 p.m. Tuesday at the funeral home. Burial will be private. Memorials may be directed to his wife and children. Bill was born Oct. 2, 1965, in Normal. He married Karen Hilton on May 4, 2015, in Peoria. She survives. He is also survived by his children, Siera Van Hook, Bloomington; Taylor and Noah Volk, Chenoa; his stepchildren, Brancen and Grace Hilton, Lexington; two grandchildren, Keian and Lilly Van Hook; eight siblings, Donald Dittman, Peoria; Kimberly (Joel) Tarmann, Minonk; Tina (Otis) Watson, Normal; Daniel (Melissa) Volk, Bloomington; Teressa (John) Moore, San Diego, Calif.; Randall (Ingrid) Volk, Litchfield, Ky.; Tammara (James) Goff, Alabama; and Pete Walls, Bloomington; his parents-in-law, Michael and Lois Pflum, Decatur; a brother-in-law, Kyle (Amanda) Pflum, Dalton City; and many nieces and nephews. He was preceded in death by his mother, Joyce Dodson Foster, and a brother, Ronald Sparks. Bill attended Minonk schools and graduated from Bloomington High School. He was a radial tire builder at Bridgestone Firestone in Normal for 30 years. Bill was an avid Harley rider, a bladder cancer survivor and competed in a triathlon. He enjoyed camping, snow skiing and spending time with family and friends. Bill loved his family and attended nearly all of his children and grandchildren's sporting events. To express condolences, please visit www.carmodyflynn.com.